Goodwin’s work has been shown nationally and internationally, including exhibitions at Tate Modern, Tate Britain, Tate Liverpool, The Photographers' Gallery, London, The National Portrait Gallery, London, the Venice Biennale and the Hasselblad Foundation, Gothenburg. His work is included in public collections such as MOMA, New York, The Tate Collection, The National Portrait Gallery, and Science Museum, London. Festival screenings of his feature-length film ‘Unseen: The Lives of Looking’, include nominations for ‘Best Documentary Feature’ 24th edition of Camerimage, Bydgoszcz, Poland (2016) and nominations in the international DOX:AWARD at CPH:DOX 2015, Copenhagen. Solo exhibitions and projects include: 'Those Who Seek My Help', permanent commission for New Karolinska Hospital Stockholm, Sweden, 2018; 'Seeing Hand', commissioned through Launch Pad, Shanghai, China, 2017. 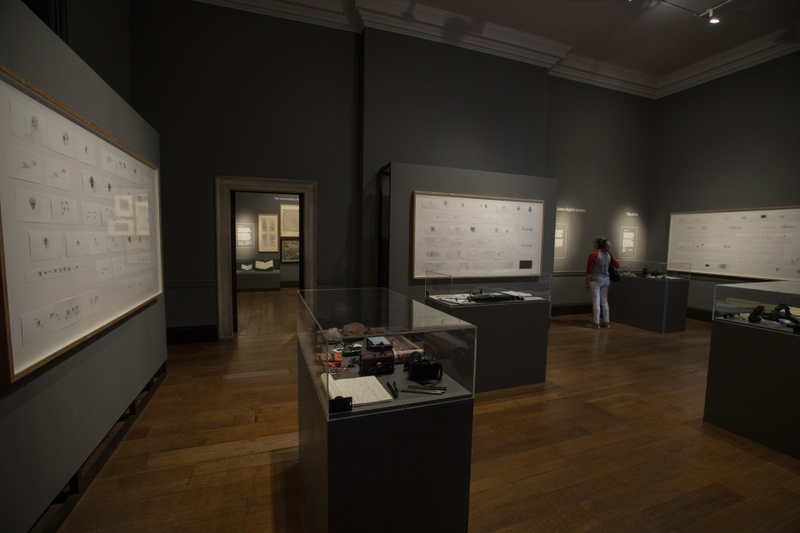 ‘Unseen: The Lives of Looking’, Queen’s House, Royal Museum’s Greenwich, London, accompanied by an exhibition of drawings and artefacts featured in the film, 2015; ‘Skill’, MIMA, Middlesbrough, 2015; ‘Poised’, Ferens Art Gallery, Hull, 2014; ‘Wander’ a permanent installation of 100 steel etching plates, Cambridge, 2014; ‘Breathe’, commissioned by Invisible Dust, animating over 1,300 pencil drawings, projected at night, opposite the Houses of Parliament, 2012; ‘Linear’ commissioned by Art on the Underground, 60 pencil portraits and 60 short films, displayed as posters, on digital screens, and at exhibition sites, across the London Underground and online 2010-2012. ‘Coax’, Raum mit Licht, Vienna and Fotoforum West, Innsbruck, Austria, 2011; ‘Cast’, at the Hasselblad Foundation, Gothenburg, Sweden, 2009 and the Photographers’ Gallery, London, 2008. Group exhibitions include: 'Typojanchi', International Typography Biennale Seoul, South Korea, 2017; ‘Air: Visualising the Invisible in British Art 1768-2017’, Royal West of England Academy, Bristol, 2017; 'I want!, I want!’ - Art and Technology selection from the Arts Council Collection, Museum and Art Gallery, Birmingham Museums, 2017; ‘Pose’, Galerie Springmann, Berlin, Germany; ‘Stories in the Dark’, The Whitstable Biennale 2016; ’Work, Rest and Play: British Photography from the 1960s until Today’ curated by The Photographers’ Gallery, London, touring China, 2015-2016; ‘Poster Art 150: London Underground's Greatest Designs’, London Transport Museum, 2013; ‘Everything Flows’, De La Warr Pavilion, 2012; ‘The World in London’, curated by the Photographers’ Gallery, 2012; ‘Exquisite Forest’, Tate Modern and Google, 2012; ‘Poetry of Motion’, National Portrait Gallery, London, 2012; ‘Images of the Mind’, Moravian Gallery in Brno, Czech Republic, 2011; ‘Grand National’, Vestfossen Kunstlaboratorium, Norway, 2010; ‘London Calling: Who Gets to Run the World’, Total Museum, Seoul 2009 also Hanjiyun Contemporary Space, Beijing, 2009. Through drawing, film, installation, photography, and sound, my practice involves close observation of individuals and groups. I often seek to reveal people, places or issues that are overlooked or uncelebrated. I have created work for galleries, cinemas, museums, and for permanent and temporary installation in public space, as well online. Many of my projects centre around my connection with people through conversations and dialogue and via my use of drawing, cameras, and sound recording equipment, to negotiate intimate exchanges. Through my work, I'm attempting to reveal and reflect upon aspects of the inner and emotional lives of the people I focus on, be they strangers encountered in the city, family and friends or specific groups of people with a shared experience of work or environment. With drawing implements (pencil, etching needle, ink pen or digital stylus), with lenses (video, film or photography) as well as creating soundtracks, I distil intense pockets of time and experience and aim to evoke a heightened sense of each person I portray, as well evoking the atmosphere of the places I encountered them in. In recent projects, I have been driven by the inability of any ‘portrait’ to fully describe a subject and have therefore been curious to explore expanded notions of ‘portraiture’, both in form and approach to a subject. More than ‘bearing witness’ to someone’s likeness and that of the environment they’re in, I’m attempting, through drawing, editing, and scoring, to delve beyond the physical surface. I’m interested in the possibility of discovering underlying emotional and psychological structures and how these may implicate an audience, reflecting on and celebrating our shared human experience and opening up even metaphysical dimensions. It is both what is left out, as well as what is captured, that has the potential to activate a viewer’s imagination. Dryden Goodwin is a Professor of Fine Art working with BA/BFA, MA/MFA and PhD students. Seeing Hand, (drawings installation and documentary film) Launch event and exhibition coinciding with art021, Shanghai Contemporary Art Fair. Commissioned by Launchpad - launch event, exhibition and permanent installation at private residence in Shanghai, to coincide with art021, Shanghai Contemporary Art Fair. For 'Seeing Hand', Goodwin made several trips to Shanghai for a combined period of 6 weeks. During this time, he lived with the collectors, familiarising himself with the immediate neighbourhood, the Lees’ friends and associates, and further afield, with the public spaces and environs of the city. He made hundreds of drawings that chronicle the people, places, and situations he encountered. Goodwin also recorded the process of image-gathering on film that will be screened as part of the exhibition. The result is a piece that captures in micro and macro the combinations of old and new, traditional and contemporary, familiarly Western and distinctly Chinese, which distinguish Shanghai and the hosts themselves. 3 large composite frames of drawings, and 1 and 45 minute documentary film. This major exhibition of historic and contemporary art traces the tradition in British art of finding inspiration in the air around us and skies above us. Air explores how our interest in air and the sky has affected the work of British artists stretching across four centuries, encompassing representations of breath, the effects of the wind, and flying creatures (both real and imaginary). The exhibition includes loan works by JMW Turner RA, John Constable RA, Eric Ravilious, Christopher Nevinson ARA, Sir John Everett Millais PRA, Samuel Palmer and Dora Carrington, alongside work from leading – and exciting emerging – contemporary artists including; Liz Butler, Annie Cattrell, Mat Chivers, Peter Ford RWA, Freya Gabie, Neville Gabie, Dryden Goodwin, Polly Gould, Jemma Grundon, Luke Jerram, Janet Haigh, Stephen Jacobson RWA, Helen Jones, Janette Kerr PPRWA, Jessica Lloyd Jones, Ian MacKeever RA, Bridget McCrum RWA, Mariele Neudecker, David Pelham, Peter Randall-Page RA RWA, Berndnaut Smilde, Kate Williams and Alex J Wood. Starting in the late eighteenth century Air charts the public’s fascination with experiments with air (including the development of air balloons), before progressing on to the industrial revolution, which introduced the concept of air pollution. The nineteenth century embraces intensive studies of clouds (newly classified by meteorologists), whilst the twentieth century encapsulates our wartime pre-occupation with aeroplanes and the intriguing trails they left upon the skyscape. Later works consider the physical possibilities of flight which shifted our perceptions of the landscape as aerial photography expanded our view of the earth from above. Contemporary work introduces new environmental issues, making reference to climate change and air-borne disease, in addition to exploring air as an integral component to the process of making. Artists consider the relationship between art and science, combining painting, photography, sculpture, installation and film, to demonstrate how air is everywhere: essential to all our lives. Unseen : The Lives of Looking was screened in the FIFA Experimental programme of the 2017 festival. FIFA festival is a non-profit organization dedicated exclusively to the worldwide promotion and recognition of films on art and media arts that aims to increase knowledge and appreciation of art among the public. The quality and originality of the selected works makes FIFA a reference, an essential actor, and a key partner in worldwide artistic and cinematographic circles. BROKEN SENSES explores the relationships between the senses, knowledge, the creation of memory, and our experience in understanding the world. How does one represent sense memory? Can one identify with sense memories one has never had through the experiences of hearing, touch, smell, taste, vision, kinesthesis, and altered states? Through personal and historical experiences, ranging from the joyful to the solemn, these embodied interventions conjure affective strategies to address blindness, sexuality, government surveillance, family, aging processes, death and grief, bliss, trauma, love, fear, and spiritual awakening. Programmed by Ruth Somalo. Unseen: The Lives of Looking was nominated for Best Documentary Feature film in the prestigious main documentary competition among just 12 international nominees for 2017 with only two UK documentaries nominated. The International Film Festival of the Art of Cinematography CAMERIMAGE is the greatest and most recognized festival dedicated to the art of cinematography and its creators – cinematographers. CAMERIMAGE contributes to the growth of cinematographers’ prestige. The unconventional format of the Festival, which awards films according to their visual, aesthetic and technical values, has turned out to be an alternative for traditional film festivals. Unseen: The Lives of Looking screened as the closing film in Whitstable Biennale 2016. Whitstable Biennale is a festival of performance, film and sound, taking place every two years on the Kent coast. The event has grown out of Whitstable’s extensive artistic community, and has developed an international reputation for showcasing the most exciting up-and-coming artists and filmmakers, and engaging audiences in a rich programme. Unseen: The Lives of Looking had its Scottish Premiere at Alchemy Film and Moving Image Festival - Hawick, Scottish Borders in 2016. Alchemy Film and Moving Image Festival is an international festival of experimental film and artists’ moving image. Alchemy Film & Arts was founded in 2010 and has produced seven editions of the Alchemy Film and Moving Image Festival. The festival is produced in partnership with Heart of Hawick in the Scottish Borders. Unseen: The Lives of Looking screened at International Film Festival Rotterdam 2016 - part of the 'Blind Spot' programme, selected by Dr Edwin Carels. Unseen: The Lives of Looking was screened at the International Film Festival Rotterdam (IFFR) 2016 in curator Edwin Carel's Blind Spot programme. 'Despite – or perhaps thanks to – the enormous increase in and development of technology, to a certain extent we remain blind. The programme Blind Spots focuses on the invisible.' IFFR offers carefully selected fiction and documentary feature films, short films and media art. The festival's focus is on recent work by talented new filmmakers. However, within the four sections the Festival presents, there is also room for retrospectives and themed programmes. Unseen: The Lives of Looking Festival had its Festival World Premiere at CPH:DOX 2015 amongst 16 international films nominated for the prestigious DOX:AWARD prize. CPH:DOX has grown to become one of the largest documentary film festivals in Europe with 97.500 admissions in 2017. CPH:DOX is devoted to supporting independent and innovative filmmaking and presents the best and brightest in contemporary non-fiction, art cinema and experimental film. With a solid base in the documentary approach to reality, CPH:DOX aims at building bridges to a wide range of related art forms on the music scene and in the visual arts. This exploration of the interaction and interfaces between different media and cultural traditions emphasizes the constant evolution of the documentary genre, and creates a space for inspiration and dialogue between different creative forms with exhibitions and performances, music and sound projects, live acts, VJ’ing and the latest concepts of expanded cinema. Cinema Premiere at the Whitechapel Gallery, London UK cinema première of artist Dryden Goodwin’s feature-length work: a profound essay about perception, identity and the creation of meaning, featuring the UK’s leading eye surgeon, planetary geologist, and human rights lawyer. Skill is an solo exhibition at MIMA of Dryden Goodwin's original drawings and his film 'Skill' (2014) focusing on his encounters with twelve people from East Durham. Each person has a hands on, specialist skill, ranging from tattooing, to wood-turning, to pigeon fancying. Skill encapsulates the drawings Goodwin made observing each person at their endeavours with the conversations that took place. The film and the drawings are a celebration of dexterity, passion and commitment, capturing a shared deftness of hand and mind as each person transforms the materials they work with. Skill was commissioned by East Durham Creates. Produced by Forma Arts. East Durham Creates is managed by Beamish, Forma, and East Durham Trust working in partnership. The project is supported by Durham County Council via East Durham Area Action Partnership and funded by Arts Council England. Curated by The Photographers’ Gallery, London, UK - touring China 2015-2016. The Photographers’ Gallery, London in collaboration with The Pin Projects, Beijing OCT-LOFT, Shenzhen and with support from the British Council present Work, Rest and Play: British Photography from the 1960s to Today. Featured as part of the 2015 UK-China Year of Cultural Exchange, this will be the first touring exhibition in China solely devoted to British photography. This exhibition presents a survey of over fifty years of British photography through the lens of documentary practices. Featuring work by some of the most significant photographers and artists of the time, it reflects photography’s growing cultural position both within the UK and on the international stage. Work, Rest and Play features over 450 images by thirty-seven acclaimed photographers and artists working across a wide range of genres and disciplines, including photojournalism, portraiture, fashion and fine art. Arranged chronologically the exhibition explores British society through changing national characteristics, attitudes and activities over the last five decades. Multiculturalism, consumerism, political protest, post-industrialisation, national traditions, the class system and everyday life all emerge under the broader themes of Work, Rest and Play. Working life finds expression and contrast through Philip Jones Griffiths’ photographs of Welsh miners in the 50s Anna Fox’s study of London office life in the 80s and Toby Glanville’s portraits of workers in rural Britain in the late 90s; Rest is depicted through landscapes and portraits of the British seaside from photographers including John Hinde, Fay Godwin and Simon Roberts; while Play features humour and the rise of popular culture realised in Martin Parr’s colourful chronicles as well as Derek Ridgers explorations of subcultures and Terence Donovan’s definitive images of British fashion. Additional works included in this exhibition are by Shirley Baker, James Barnor, Cecil Beaton, Jane Bown, Vanley Burke, Jason Evans, Julian Germain, Stephen Gill, Dryden Goodwin, Tom Hunter, Harry Jacobs, Tony Ray Jones, Karen Knorr, Sirkka-Liisa Konttinen, Melanie Manchot, Linda McCartney, Spencer Murphy, Mark Neville, Nigel Shafran, Paul Seawright, David Spero, Clare Strand, Jon Tonks, Lorenzo Vitturi, Tim Walker, Patrick Ward, Tom Wood and Catherine Yass. Also on display is The World in London, a major public art project initiated by The Photographers’ Gallery in 2012 to coincide with the London Olympic and Paralympic Games. The project presents 204 photographic portraits, from both established and emerging talents, of 204 Londoners, each originating from one of the nations competing at the Games. It is a celebration of photographic portraiture as an artistic form of expression as well as the city’s rich cultural diversity. Work, Rest and Play: British Photography from the 1960s to Today will be the inaugural exhibition in the new C2 Space, Shenzhen OCT-LOFT, China. The exhibition will continue to tour to Beijing and Shanghai at dates to be announced. Accompanying Goodwin’s' essay film ’Unseen: The Lives of Looking’, when it was shown at the Queen's House, Royal Museum's Greenwich, was an exhibition which included Goodwin’s drawings produced during the production of the film, as well as artefacts used by the individuals featured in the film - the eye surgeon, the planetary explorer, the human rights lawyer and the artist. In addition, items from the Museum’s collections highlighting three figures from the history of the Queen’s House, Royal Observatory and Royal Hospital School, were shown to consider how working at Greenwich has always involved detailed observation. ’Unseen: The Lives of Looking’ is Dryden Goodwin’s first feature-length essay film. The film focuses on four individuals, each with a distinct relationship to looking - an eye surgeon, a planetary explorer, a human rights lawyer and an artist/filmmaker. Told through Goodwin’s closely observed drawings, camera work and multilayered soundtrack, the film explores different scales, forms and reasons for looking, in a poetic and metaphysically charged journey. Revealing the empathy and dexterity of an eye surgeon, working with the fragility of the human eye; the quest of a NASA planetary explorer to decode the cosmos and find evidence of life on Mars; and the scrutiny, of the British government, by a human rights lawyer, in extraordinary rendition, drone attack and mass surveillance cases. The film’s perspectives range from minute details to panoramic expanses, building an atmospheric and sensual matrix around its subjects. Goodwin includes fleeting vignettes of strangers and a brief focus on his father and son, highlighting the tension in his work between intimacy and anonymity. The film considers both the physical act of looking and how we perceive the world around us: how we contemplate the known and the unknown, the personal and the remote and the imaginative leaps taken to reveal what might be concealed or out of sight. Skill, is a film in 12 parts, focusing on Goodwin’s encounters with twelve people from East Durham in the North East of England. Each person has a hands-on specialist skill, ranging from tattooing, to wood-turning, to pigeon fancying. Skill encapsulates the drawings Goodwin made observing each person at their endeavours with the conversations that took place. The film and the drawings are a celebration of dexterity, passion and commitment, capturing a shared deftness of hand and mind as each person transforms the materials they work with. The film was screened at various indoor and outside venues across the county, alongside images from the film being shown on multiple billboard poster sites, as well as a website Commissioned by East Durham Creates and produced by Forma Arts. Poised, Solo exhibition, Ferens Art Gallery, Hull In a series of interlocking episodes, Dryden Goodwin’s 28-minute film explores the physical and emotional dynamics of a group of young female divers. Portraying the girls on their own, interacting with each other, and under the rapt, imploring gaze of their coaches, Goodwin’s camera combines extreme close-up with oblique, atmospheric detail to illuminate their intensity of focus and their idealisation of grace and ’flow’. Looking beyond the arc of the dive itself to consider its metaphorical, even metaphysical resonance as a rite of passage between different states, Goodwin’s taut, pinpoint imagery and vibrant, serpentine soundtrack lend the divers’ devotion and zen-like composure an ethereal, otherworldly quality that makes each sudden plummet into darkness even more poetic and poignant. In this, the title, ’Poised’, has multiple meanings - evoking the space between practicing and perfecting a new dive, between stillness and movement, absorption and play; between being utterly ’in the moment’ and on the brink of imminent, inescapable change. Three animated poster from 'Linear' was one of 150 selected from the 3300 Underground-specific posters from the London Underground's 150 year history. The largest London transport poster exhibition in over half a century. London Transport Museum’s blockbuster exhibition Poster Art 150 – London Underground’s Greatest Designs, closes on Sunday 5 January 2014. Supported by Siemens it showcases 150 of the greatest Underground posters ever produced and features works by many famous artists including Edward McKnight Kauffer and Paul Nash, and designs from every decade over the last 100 years. BrightestLondon web The posters were selected from the Museum’s archive of over 3,300 Underground posters by a panel of experts; the 150 that appear in the exhibition show the depth and diversity of the Museum’s collection. It is also the last chance to have your say on the all-time greatest design by voting in the gallery or online in The Siemens Poster Vote. The most popular poster will be revealed at the end of the exhibition. Nearly 40,000 people have voted so far since the exhibition opened in February. Entry to the exhibition is included in price of admission. Since its first graphic poster commission in 1908, London Underground has developed a worldwide reputation for commissioning outstanding poster designs, becoming a pioneering patron of poster art - a legacy that continues today. Our new blockbuster exhibition Poster Art 150 – London Underground’s Greatest Designs, will showcase 150 of the greatest Underground posters ever produced. Supported by Siemens, and forming part of the 150th anniversary celebrations of the London Underground, the exhibition will feature posters by many famous artists including Edward McKnight Kauffer and Paul Nash, and designs from each decade over the last 100 years. The posters were selected from the Museum’s archive of over 3,300 Underground posters by a panel of experts; the 150 that will appear in the exhibition show the range and depth of the Museum’s collection. Poster Art 150 is a fitting exhibition to commemorate the 150th anniversary of the world’s first underground railway, as the last major Underground poster retrospective was held in 1963 to celebrate the centenary of the Underground. Well-known posters, including the surrealist photographer Man Ray’s ‘Keeps London Going’ pair, will feature alongside lesser-known gems. The exhibition will also offer a rare opportunity to view letter-press posters from the late nineteenth century. The exhibition focuses on six themes: Finding your way includes Underground maps and etiquette posters. It also includes posters carrying messages to reassure passengers by showing them what the Underground is like. Brightest London celebrates nights out and sporting events, showing the brightest side of London. Capital culture is about cultural encounters, be these at the zoo or galleries and museums. Away from it all looks at the way London Underground used posters to encourage people to escape, to the country, the suburbs and enjoy other leisure pursuits. Keeps London going features posters about how the Underground has kept London on the move through its reliability, speed and improvements in technology. Love your city shows the best of London’s landmarks as featured in Underground posters over the years. 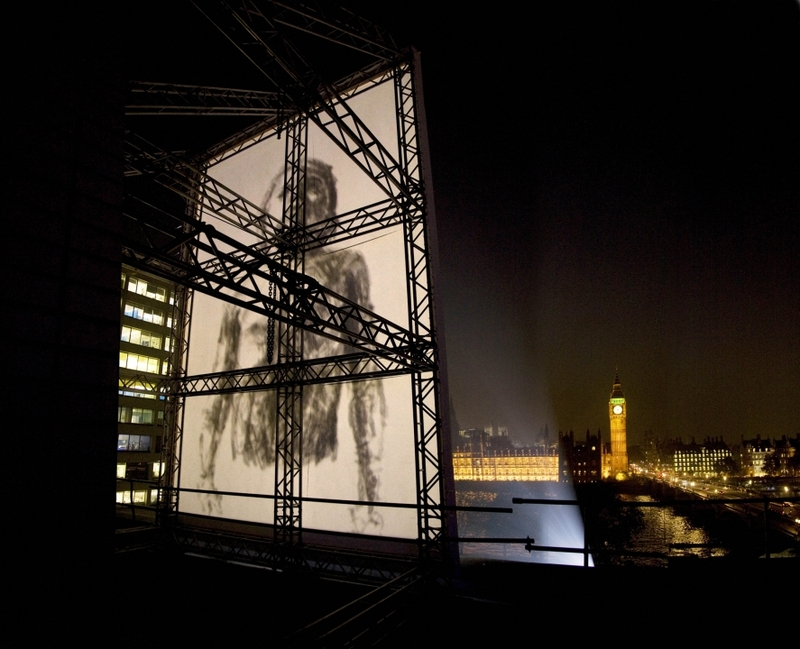 Goodwin's artwork 'Breathe' was first shown set into London's skyline, as an 8-metre projection screen, constructed on the roof of St Thomas' Hospital, next to Westminster Bridge, facing over the river Thames towards the Houses of Parliament. From dusk, every night for 3 weeks, in October and November 2012, people on buses, in cars and on foot, crossing Westminster Bridge could see a animation made up of more than 1,300 pencil drawings of Dryden Goodwin 5-year-old son. The piece, entitled Breathe, was part of a programme of artist and scientist collaborations called Invisible Dust. Curator and Director of Invisible Dust, Alice Sharp linked Goodwin with Professor Frank Kelly, an expert on lung health at King's College London and an advisor to the Government on air pollutants. Goodwin in conversation with Professor Frank Kelly and Invisible Dust director, Alice Sharpe presented and discussed the projects and an Environmental Select Committee at the Houses of Parliament. Featured Artist, contributing a 'seed' animation. This Exquisite Forest is an online collaborative art project, presented by Tate and Google, which enables people to create short animations that grow from each other’s contributions. It can be accessed via a website and through a physical installation at Tate Modern. Taking as the starting point a series of short animation sequences created by artists represented in Tate’s collection, users of the website and visitors to the installation are invited to draw and animate new sequences and thus continue the ‘seeds’ begun by the artists. As more sequences are added, the videos dynamically branch out and evolve, forming multiple new visual narratives. The project takes inspiration from the Surrealist idea of the exquisite corpse, a creative exercise in which one person begins a drawing or starts a sentence, then passes it on to a series of other people to continue. This Exquisite Forest explores what happens when the technique is reinvented as a new form of collaborative drawing for a global online community The artists taking part are Miroslaw Balka, Olafur Eliasson, Dryden Goodwin, Raqib Shaw, Julian Opie, Mark Titchner, and Bill Woodrow. Tate have also invited Film4.0’s roster of talented animators to be among the first to respond to the artists by contributing new sequences to the site. 'Heathrow' by Dryden Goodwin (1994) shown as part of, this major exhibition exploring the instinctive human desire to fly from the classical era to the modern day. Starting with the imaginations of Leonardo da Vinci and Francisco Goya and ending with space travel, satellite images and everyday air travel, it is an exciting exploration of creative responses to flight. Discover classical flight and the fall of Icarus. Learn about the Wright brothers, Yuri Gagarin and the history of aviation and space travel. Explore the uses of flight from everyday travel and transportation to sky battles and air raids. Enjoy spectacular aerial views and satellite imagery. Flight and the Artistic Imagination includes an intriguing combination of paintings, sculpture, photographs, drawings, prints and video, by artists such as Leonardo da Vinci, Henri Matisse, Paul Nash, Peter Lanyon and Hiraki Sawa. The exhibition contains work from national collections such as the Imperial War Museum, the British Museum, Arts Council Collection and the National Galleries of Scotland. Photographers’ Gallery, an offsite exhibition showing Victoria Park, London. Coinciding with the London 2012 Olympic and Paralympic Games, this project set out to bring together 204 portraits of 204 Londoners, each originating from one of the competing nations. A group show, consisting of 1 work, at Moravska Galerie, Czech Republic Searching Damien, 2007, 338 dip pen and ink drawings and animation on ipod. SE8 Gallery, Deptford, London, UK. A group show, consisting of 1 work, at SE8 Gallery, London, UK. THE HALF-SHUT DOOR 18th February – 19th March STEFAN BRÜGGEMANN DRYDEN GOODWIN JOÃO ONOFRE HANS OP DE BEECK For this exhibition, the relationship between vision and sound is inverted, with priority being given to the auditory. The visual is conspicuous by its absence, having been subsumed by sound, which creates a space for the audience to explore. The work can be seen as being made up of two components, the audio, which is installed in the gallery, and the implied visual, which is alluded to but remains absent in the main exhibition space with the exception of documentary evidence. Flight, 2006, soundtrack from single screen film. A group show, consisting of 1 work, at Vestfossen Kunstlaboratorium, Vestfossen, Norway Dryden Goodwin showed Two Thousand and Three, 2003, 16mm film loop installation. GRAND NATIONAL - ART FROM BRITAIN 9 May – 3 October 2010 Grand National is the most extensive exhibition of works by British artists to be held in Norway in over a decade. It takes as its starting point the contemporary position of artists located in an internationally bound artworld in which ties to nation and national heritage are no longer the dominant or defining strategies they once were. The politics of an election and the shadow of financial breakdown in Britain provides a cyclical point of vantage from which to look to the aggressive and divisive British politics of the late 1980s and the recession of the early 1990s; the rubble from which artists in Britain emerged with little to lose. 14 May 2010 One Thing Leads to Another – Everything is Connected Exhibition at City Hall Add your comments or feedback Artworks from Stanmore to Stratford. Exhibition at City Hall Nadia Bettega, John Gerrard, Dryden Goodwin, Richard Long, Daria Martin, Matt Stokes, Goldsmiths MFA Art Writing students The artists were invited to make new works at a variety of locations on the Jubilee line, which was first opened in 1979. Since June 2009, they have been investigating ideas such as time, economics and travel and our changing relationship with them over the last 30 years. Each work brings a new understanding to these concepts in the context of the Tube. They provide insights into how we use our time when we travel, what broader ideas influence our reasons for travel and the nature of our individual and collective relationships with time and the network. 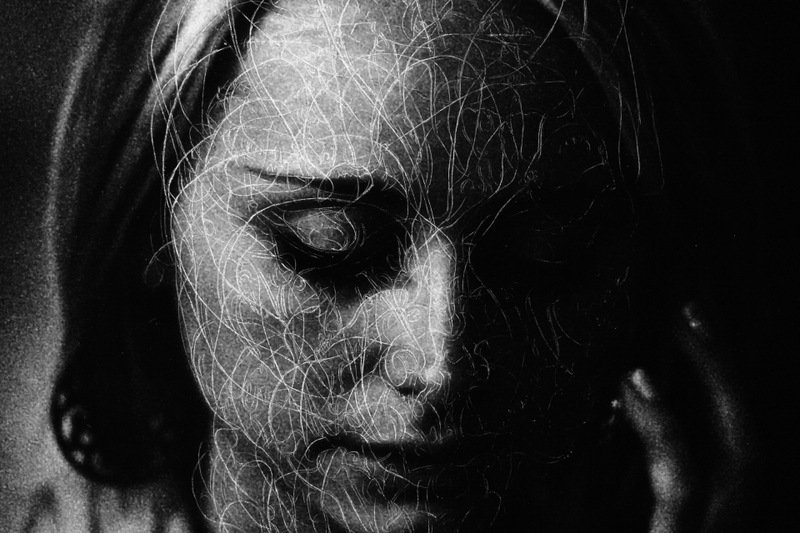 Linear, 2010, 60 drawings, pencil on paper, and 60 films, shot on video. Across the London Tube network. A public art project for Art on the Underground, London, UK, for 60 portraits of Jubilee Line staff and accompanying films. Linear, 2010, 60 portraits of Jubilee line staff, pencil on paper, and accompanying films, shot on video. Work presented across digital screens, as leaflets, posters, on exhibition sites and dedicated website. A group show, consisting of 1 work, at Vivid, Birmingham, UK. Reveal (short film), 2003, Single screen film, shot on video. Dorsky Gallery, New York, USA. A group show, consisiting of 1 work, at the Dorsky Gallery, New York, USA. CITY BEATS LAURA BRUCE, RAINER GANAHL, DRYDEN GOODWIN, ALEXANDER HEIM, BEN JUDD, STEPHAN PASCHER, JEFF PREISS, AND ALEX VILLAR Curated by Berit Fischer September 13 – November 15, 2009 Opening reception: Sunday, September 13, 2:00–5:00 p.m. “Everywhere where there is interaction between a place, a time and an expenditure of energy, there is rhythm.” — Henri Lefebvre, Rhythmanalysis Dryden Goodwin showing Reveal (short film), 2003, Single screen film, shot on video. The City Gallery, Leicester, UK. A group show, consisting of 1 work, at The City Gallery, Leicester, UK. Cradle 15, 2008, Scratched Black and White Photograph. Who am I? Gallery, Science Museum, London, UK. A permanent commission consisting of 3 works, for the the Who Am I? Gallery, Science Museum, London, UK. Caul 8, 2010, Photographic print mounted on lightbox. Cradle Head 4, 2010, Scratched photograph. Synapse, 2010, over 400 drawings, pen on paper. A group show, consisting of 2 works, at Hanjiyun Contemporary Space, Beijing, China and Total Museum, Seoul, Korea. Searching Damien, 2007, 338 dip pen and ink drawings and animation on ipod. Red Studies, 2009, 6X watercolours from Red Studies series. Tate Modern, London, Dundee Contemporary Arts, Scotland, FACT, Liverpool, Vivid, Birmingham, Showroom, Sheffield, Glimmer, The 7th Hull International Short Film Festival, Chapter Arts Centre, Cardiff, Wales, Site Festival, Stroud Valley Artspace and Cinecity - Brighton Film. Mermaid Arts Centre, Bray, Co. Wicklow, Ireland. 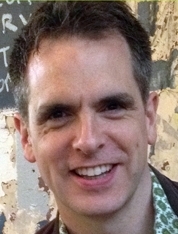 Ivan Dougherty Gallery, Sydney, Australia, Gallery of Modern Art, Brisbane, Australia, eMerge Media Space, James Cook University, Townsville, Australia, and Melbourne Cinémathèque, Australia. A group show, consisting of 1 work, at the Tate Modern, London, Dundee Contemporary Arts, Scotland, FACT, Liverpool, Vivid, Birmingham, Showroom, Sheffield, Glimmer, The 7th Hull International Short Film Festival, Chapter Arts Centre, Cardiff, Wales, Site Festival, Stroud Valley Artspace and Cinecity - Brighton Film Festival. Mermaid Arts Centre, Bray, Co. Wicklow, Ireland. Ivan Dougherty Gallery, Sydney, Australia, Gallery of Modern Art, Brisbane, Australia, eMerge Media Space, James Cook University, Townsville, Australia, and Melbourne Cinémathèque, Australia. A solo show, consisting of 5 works, at the Hasselblad Foundation, Göteborg, Sweden. DRYDEN GOODWIN : CAST 24/1 - 8/3 In this exhibition, Cast, Dryden Goodwin presents five ambitious new series of works - Cradle, Shapeshifter, Casting, Caul and Rock. Each series features portraits of strangers captured by the artist as he has travelled through London. The title Cast suggests a plurality of meanings, all of which have resonances with the work, from casting a line to casting a shadow, from casting a film role to casting a sculpture, from casting suspicion to casting a spell. Dryden Goodwin (b. 1971) lives and works in London. He graduated from the Slade School of Fine Art in 1996 and has exhibited nationally and internationally. The works in this exhibition were co-commissioned by The Photographers' Gallery and Photoworks UK. Cradle, 2008, Series of 7, scratched black and white photographs, 1600mm x 1110mm. Caul, 2008, 7 diptychs, digital photographs with digital drawing, 1225mm x 450mm. Casting, 2008, 5 Diptychs, Photographs and pencil on paper, diptych size 2000mm x 660mm. Shapeshifter, 2008, 690 drawings, pencil on paper, each drawing 50mm X 37.5mm. Rock, 2008, animation, drawings made with digital stylus and tablet, 6 minutes 40 seconds loop. Princeton University Museum, Princeton, USA. A group show, consisting of 2 works, at Princeton University Museum, Princeton, USA. Reveal (short film), 2003, Single screen film, shot on video. Flight, 2006, Single screen film, shot on video with drawn interventions. The Photographer's Gallery, London, UK. A solo show, consisting of 5 works, at the Photographer's Gallery, London, UK, for Photoworks & the Photographer's Gallery, London. Cradle, 2008, Series of 7, scratched black and white photographs, 1600mm x 1110mm. Caul, 2008, 7 diptychs, digital photographs with digital drawing, 1225mm x 450mm. Casting, 2008, 5 Diptychs, Photographs and pencil on paper, diptych size 2000mm x 660mm. Shapeshifter, 2008, 690 drawings, pencil on paper, each drawing 50mm X 37.5mm. Rock, 2008, animation, drawings made with digital stylus and tablet, 6 minutes 40 seconds loop. Cabot Circus Retail Centre, Bristol, UK. A public art commission, consisting of 1 work, for the Cabot Circus Retail Centre, Bristol, UK. 12 Portraits, 2008, stainless steel etchings. The Calvert Centre, Hull, UK. A public art commission for a health centre in Hull, consisting of 1 work, at the Calvert Centre, Hull, UK. 20 portraits, 2007, pencil on paper, presented as photographs. A group show, consisting of 1 work, at the Tate Modern, London, UK. Reveal (short film), 2003, single screen film. The National Portrait Gallery, London, UK. A solo show, consisting of 1 work, at the National Portrait Gallery, London, UK. Sustained Endeavour, 2006, 25 pencil drawings of the same photograph of Sir Steve Redgrave and accompanying animation. Akbank, Istanbul, Turkey and Triangle Gallery, Space Studios, London, UK. A group show, consisting of 1 work, at Akbank, Istanbul, Turkey and Triangle Gallery, Space Studios, London, UK. Reveal, 2003, Single screen film shot on video with accompanying soundtrack and 36 Biro drawings. A solo show, consisting of 1 work, at the Stephen Friedman Gallery, London, UK. Suspended Animation: 30 drawings of the Same Photograph, 2002, pencil on paper. Feldman Gallery, Portland, Oregon, USA. A solo show, consisting of 1 work, at the Feldman Gallery, Portland, Oregon, USA. Flight, 2006, single screen film. A solo show, consisting of 1 work, at the Chisenhale Gallery, London, UK, for Animate, Channel 4 and the Arts Council, England. Flight, 2006, single screen film. New Art Gallery, Walsall, UK. A group show, consisting of 1 work, at the New Art Gallery, Walsall, UK. One Thousand Nine Hundred and Ninety Seven, 1997, 16mm film on light box. A group show, consisting of 2 works, at Spacex Gallery, Exeter, UK. Two Thousand and Three, 2003, 16mm film loop installation. Cradle 1, 2002, Scratched Black and White Photograph. Angel Row Gallery, Nottingham, UK. A group show, consisting of 2 works, at Angel Row Gallery, Nottingham, UK. Two Thousand and Three, 2003, 16mm film loop installation. Cradle 1, 2002, Scratched Black and White Photograph. The Slade School of Fine Art, UCL, London, UK. A solo show, consisting of 1 work, at the Slade School of Fine Art, UCL, London, UK. Apeejay New Media Gallery, New Delhi, India. A group show, consisting of 1 work, at Apeejay New Media Gallery, New Delhi, India. Wait, 2000, 5 screen video installation and soundtrack. a solo show, consisting of 3 works, at Pro-Arte, St Petersburg, Russia. Ospedale, 1997, Single screen film with soundtrack. Hold, 1996, Single Screen film. Shot on Super 8 screened from video. Reveal, 2003, Single screen film, shot on video. the New Art Gallery, Walsall, UK. A solo show, consisting of 5 works, at the New Art Gallery, Walsall, UK. Dilate, 2003, 8 screen Video installation and soundtrack. Capture, 2001, 11 scratched photographs. Cityscapes, 2001, Restaurant (2001) (pencil on paper), 101 x 137cm. Station (2001) (pencil on paper) 101 x 137cm. Street (2001) (pencil on paper) 101 x 137cm. Airport (2001) (pencil on paper) 101 x 137cm Cradle 1,2,3,4, 2002, Series of 4, scratched black and white photographs, 1600mm x 1110mm One thousand Nine Hundred and Ninety Seven, 1997,An installation consisting of 2 elements: One Thousand, Nine Hundred and Ninety Seven (film loop) (1997) and One Thousand, Nine Hundred and Ninety Seven (lightbox). Stay takes three distinct landscapes and presents the viewer with an experience of moving through space while engaging them in the contemplation of still moments. By presenting the individual photographs that make up the animated sequence with the projected image and soundtrack, Stay explores the interplay between momentum and inertia, the imperative for motion and the desire to be still and survey. The shifting soundscape fuses audio captured on location with additional orchestration by the artist. This emotionally ambiguous journey, through man-made and natural surroundings, is both an invitation to linger in these environments, as well as a driving force to leave, as the viewer rushes through the fleeting landscapes. At what point in the journey have we come in? Is it impending danger, yearning or exaltation that creates the tension to move through or remain? The Lighthouse, Poole, Dorset, UK. A solo show, consisting of 1 work, at the Lighthouse, Poole, Dorset, UK. Stay, 2004, video projection, soundtrack and 3 composite photographs. A solo show, consisting of 2 works, at the Stephen Friedman Gallery, London, UK. Stay, 2004, video projection, soundtrack and 3 composite photographs. State, 2004,State - (Amit) (2004) 9 dry point drawings and one copper plate, 220 x 26.5cm (86 1/4 x 10 1/2in). State - (Jeff) (2004) 9 dry point drawings and one copper plate, 220 x 26.5cm (86 1/4 x 10 1/2in). State - (Jo) (2004) 9 dry point drawings and one copper plate, 220 x 26.5cm (86 1/4 x 10 1/2in). State - (City) (2004) 10 dry point drawings and one copper plate, 242 x 26.5cm (95 1/4 x 10 1/2in). Manchester Art Gallery, Manchester, UK. A solo show consisting of 1 work, at Manchester Art Gallery for the Film and Video Umbrella. Dilate, 2003, 8 screen Video installation and soundtrack. A group show, Dryden Goodwin's project consisted of a large scale installation work in the Arsenale at the 50th Venice Biennale, Italy. Above/Below, 2003, 2 screen video installation and soundtrack. A group show, consisting of 1 work, at the Tate Britain, London, UK. Hold, 1996, single screen film, shot on super 8. A solo show consisting of 1 work, at Lacock Abbey, Wiltshire, for Picture This and South West Screen. Reveal, 2003, Single screen film, shot on video. A group show, consisting of 1 work, at the Baltic, Gateshead, UK. Above/Below, 2003, Two screen video installation and soundtrack. A group show, consisting of 1 work, at the Gallery of Modern Art, Glasgow, Scotland. One Thousand Nine Hundred and Ninety Seven, 1997, 16mm film loop installation. A group show, consisting of 2 works, at Photographer's Gallery, London (UK), Moderna Galeria, Ljubljana (Slovenia), 14, Warf Road, London (UK), House of Artists, Zagreb (Croatia), Rudolfinum, Prague (Czech Republic), The Bunkier Gallery Cracow (Poland) and Arsenals, Riga (Romania). Wait, 2000, 5 screen video installation and soundtrack. Closer, 2002, 3 Screen video installation and soundtrack. Closer, 2002, 3 screen video installation and soundtrack. A solo show, part of Art Now at the Tate Britain, London, UK. Canal de Isabel II, Madrid, Spain. A group show, consisting of 2 works, at Canal de Isabel II, Madrid, Spain. Suspended Animation - 29 Drawings of the Same Photograph, 2000, pencil on paper. Suspended Animation - 26 Drawings of the Same Photograph, 1998, pencil on paper. A solo show consisting of 2 works at the Stephen Friedman Gallery, London, UK. Wait, 2000, 5 screen video installation with soundtrack. Drawn to Know, 2000, 3 sequences. Digital stylus and tablet over digital photographs. A group show, consisting of 1 work, at Stephen Friedman Gallery, London, UK. Suspended Animation - 29 Drawings of the Same Photograph, 2000, pencil on paper. A group show, consisting of 1 work, at the Tate Gallery, Liverpool, UK. Wait, 2000, Five screen video installation and soundtrack. ZKM, Zentrum fur Kunst und Medientechnologie, Karlsruhe, Germany. A group show, consisting of 1 work, at ZKM, Zentrum fur Kunst und Medientechnologie, Karlsruhe, Germany. Within, 1998, Four screen video installation and soundtrack. A solo show, consisting of 4 works, at Mid Pennine Arts, Lancashire. About, 1998, 3 Screen video installation. Ospedale, 1997, Single screen film. Hold, 1996, Single screen film. Heathrow, 1994, Single screen film. a group show, consisting of 1 work, at LUX Gallery, London, UK. Within, 1998, Four screen video installation and soundtrack. An Installation Of 3 Separate Elements: 1 Film Loop, 1 Video Loop And 1 Flick Book. A group show, consisting of 1 work, at Kettle's Yard, Cambridge, UK. About, 1998, Three screen video installation and soundtrack. Corner House, Manchester/Camden Arts Centre, London/CCA, Glasgow. A group show, consisting of two works, at Corner House, Manchester, Camden Arts Centre, London and CCA, Glasgow. Hold, 1996, Single Screen film, shot on super-8. One Thousand Nine Hundred and Ninety Six, 1996, 16mm film loop installation. Celebrating the Animated GIF, exhibited on 'The Wall' at the Photographers’ Gallery, London. The exhibition features over 40 GIF images by practitioners from a range of creative disciplines. Speaker at the inaugural ThinkSpace discussion a cross-disciplinary debate programme at UCL curated by Jeremy Melvin organised by The Bartlett School of Architecture. First shown alongside the feature-length film, 'Unseen: The Lives of Looking' at the Queen's House, Royal Museum's Greenwich, for 5 month show, this multifaceted work consisting of 4 large frames, displaying the over 100 drawings created during the making of the film asnd 4 vitrines containing artefacts used by the individuals featured in the film - the eye surgeon, the planetary explorer, the human rights lawyer and the artist/film maker. Cambridge bus interchange – part of major new development of Cambridge, 100 etched stainless steel metal plates, with portraits drawn by Goodwin as he roamed Cambridge, inset into the paving stones of the main bus interchange.The public will glimpse these portraits in a number of ways; as they pass through the interchange, as they wait for buses at the shelters and also as they return to the interchange, alighting from the buses. 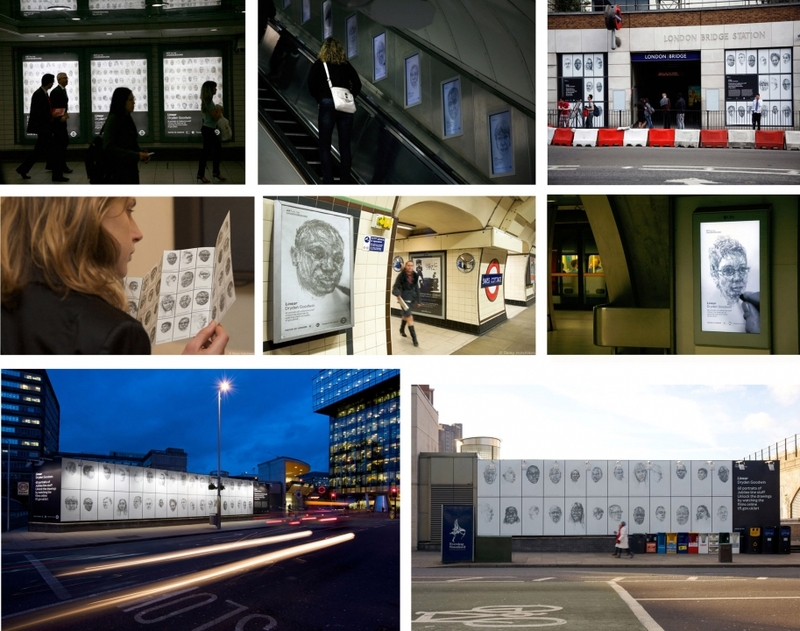 Wander considers how this collection of 100 hand drawn portraits of unknown people from Cambridge, will cause the variety of communities that use the bus shelters to respond. From a day-tripping tourist, who may only see some of the plates, to a local resident having the possibility to discover previously unnoticed etchings along their daily route through the site over many years. The 72 minute film in 12 parts, focuses on artist Dryden Goodwin's encounters's with 12 people from the East Durham area. Each person has a hands-on specialist skill, ranging from tattooing, to woodturning to horse training. 'Skill' encapsulates the drawings Goodwin made observing each person at their work and the conversations that took place. A celebration of dexterity, passion and commitment, capturing a shared deftness of hand and mind, as each person transforms the materials they work with. Breathe is a drawn animation made up of over 1,300 small intense drawings, featuring the artist's 5 year old son breathing. The emphasis of the work is that air can both sustain us but also corrupt and damage us. Breathe has developed from 1 of 3 projects curated by Alice Sharpe part of the project Invisible Dust. The mission of Invisible Dust is to encourage awareness of, and meaningful responses to, climate change, air pollution and related health and environmental issues. It achieves this by facilitating a dialogue between visual artists and leading world scientists. Invisible Dust strives, through its creation of high impact and unique arts programmes, alongside new scientific theories, to create an accessible, imaginative and approachable forum and stimulus. Goodwin has worked with Scientist Professor Frank Kelly of of Kings College and St. Thomas’ Hospital. 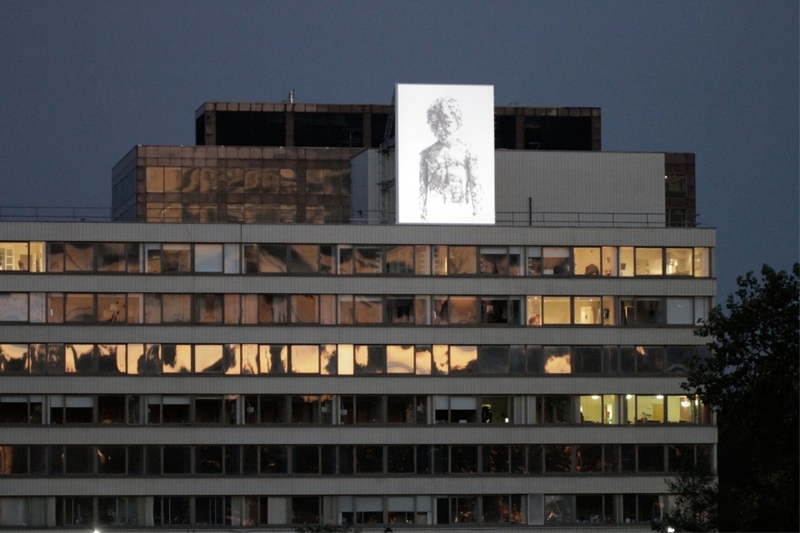 Invisible Dust was Awarded 1 of only 2 Wellcome Trust’s ‘Large Arts awards’ given in July 2010. Talk to the Environmental Selected Committee, ’Turner Updated’, discussing ’Breathe’ installation showing on St Thomas’s Hospital, opposite the Houses of Parliament. For the making of this project Goodwin accompanied Louis in different situations over an 18 month period, closely observing his activities and daily routines, for example when at home, at work, in meetings, during meals, in the gym, watching a film or driving his car. Although occasionally alone, he was mostly drawn in the company of others, either one person or a combination of people, all with different relationships with him, for example work colleagues, his trainer, members of his family, his wife, his son, his daughters, his father, his mother or his friends. Through this activity Goodwin made 440 small pencil drawings, for the majority of the time drawing back and forth between the subject and the individuals he came into contact with, some of the drawings are only a few lines, others are more worked up. Goodwin presents the drawings in two ways: inanimate, in a frame, mounted in the order that they were made and secondly as an animation, in which the drawings are sequenced in multiple combinations to further explore, reflect on and draw out the suggestions and nuances contained within the individual drawings and relationships between them. Louis considers the idea that a portrait is never adequate to the task of portraying an individual. It still remains that many aspects and subtleties of each interaction are concealed or distorted, however, it seems possible that these absences are active spaces for the imagination. The 'portrait' considers how individuality is expressed and defined by one's relationships with others. In the on going series Mould the surface of photographs are given further dimensions. Using folding, scoring and puncturing, intense studies of heads are coaxed onto the cusp of three dimensions. In all senses of the word, Goodwin tries to discover a form for his speculations about these people, through his touch he attempts to reanimate both the surface and the underside of the photographs. Presented separately and in clusters Mould suggests a proliferation of associations, a breeding ground of imaginative connections. Goodwin, interested in the re-introduction of the hand and mind into the infinitively reproducible photographic image, shapes and constructs these photographic surfaces into unique low reliefs. presentation followed by an in-conversation with writer Geoff Dyer chaired by curator Camilla Brown, Part of the Images of the self series n the 1920s and 30s, the photographer E.O. Hoppé took his camera out onto the streets of London, Berlin and New York and photographed ordinary life. Smiling street urchins, bathing orphans and exhausted immigrants gaze at the supposedly neutral camera. This discussion, timed to coincide with the National Portrait Gallery’s major retrospective of Hoppé’s work, explores early twentieth-century photography’s search for ordinary, representative subjects, placing Hoppé alongside contemporaries such as Bill Brandt, Walker Evans and Dorothea Lange. Together Geoff Dyer, author of The Ongoing Moment, a writer’s meditation on the nature and history of photography, and the artist Dryden Goodwin will ask what was at stake when photography switched its focus from the drawing-room to the street. The discussion will also explore the legacy of this kind of portraiture. Recently, Dryden Goodwin has made a series of portraits of 60 London underground staff going about their work, and filmed himself working with his subjects. How does this process differ from photography? And how has public art developed, over the course of the last century? The discussion will be chaired by Camilla Brown, a curator and writer on contemporary art. Drawing Projects: Dryden Goodwin interview Cornelia Parker, Jeff Koons and William Kentridge are among the artists who have contributed to a new book which explores why draughtsmanship is still fundamental to contemporary practice. In this edited extract from 'Drawing Projects' by Jack Southern and Mick Maslen, British artist Dryden Goodwin gives a highly personal account of why he thinks drawing is the most emotive and revealing medium available to an artist. "...On the cusp between a preserved world of tradition and ceremony and a contemporary one of media scrutiny and celebrity culture, Prince William encapsulates the myriad of dilemmas that confront the Royal Family as it evolves. He is seemingly available to all in pictures and interviews, whilst a real sense of this heir to the throne is inevitably ungraspable and out of reach. Working from video stills selected from YouTube produced a balance for me between intimacy and remoteness. I've created decontextualised moments; the portrait is composed of different expressions with his eyes shut, possibly of contemplation or of fleeting ecstasy or sorrow. When making the work my imagination was filled with a kind of accentuated sense of Prince William. I like this idea of developing my own imagined knowledge of him through the act of painting with watercolour; speculating, interested in what might be revealed. I'm interested in the relationship between my experience of making the work and how this translates to its viewing. With his eyes shut there seems to be a greater sense of his inner thoughts, even though you are inevitably excluded, I'm interested in how this spurs the imagination. The closed lids are a barrier that made me want to approach and go beyond. There's also something challenging about painting from a very low-resolution image. You have to interpret more, invent and embellish; meaning, to a certain extent, that the contours of his face were constructed in the mind's eye, like a strange vivid dream of being with someone famous where you start to have a sense that you are close to them. When you paint someone using red watercolour it seems simultaneously fragile but visceral. There is this received notion of blue blood to differentiate royalty, but I like the association with actual blood, emphasising this more fundamental truth and connection with Prince William as just another person..."
For the 2010 update of the Who am I? gallery Dryden Goodwin created three new works, Caul 8, Cradle Head 4 and Synapse, installed in a case including brain scanning technology. Goodwin makes portraits of strangers he sees in passing on the street and public transport, and uses drawing, photography and film to attempt to discover insights into these strangers. He sees relationships between the way he uses drawing as an act of speculation and exploration and scientists' uses of instruments to try and understand the human brain. As well as responding to physical appearance, Goodwin's drawn marks seem to make visible the unseen aspects of the individuals he draws, suggesting a sense of mystery and the unknowable. In turn, through these richly detailed portraits, as viewers we arrive at our own conclusions about his subjects, their thoughts and feelings. Seeing them reminds us of the mysteries inherent in being human, which we may never completely unravel. We find ourselves asking questions about whether science or art gives us a truer picture, or whether they just reveal different things. Linear, by artist Dryden Goodwin, is a series of portraits of individuals with different working roles on the Jubilee line. Goodwin has drawn 60 pencil portraits of staff at work, or at moments of pause in their day, and has created 60 films recording the drawings being made. Each drawing concentrates on a person’s face and head. The films show the accelerated progression of these drawings, accompanied by fragments of the conversation between the artist and ‘sitter’, revealing a multitude of personal exchanges and stories. Together they form an intimate and diverse social portrait of this community of workers. The drawings are displayed on poster sites across the London Underground network. The films can be viewed online, offering the opportunity to unlock the creation of each portrait. One Thing Leads to Another, Everything is Connected Lily Hall traveled the Jubilee tube line to explore the recent Art on the Underground project, finding artworks from Stanmore to Stratford. Annual Seminar Understanding British Portraits is an active network with free membership for professionals working with British portraits including curators, museum learning professionals, researchers, academics and conservators. We aim to enhance the knowledge and understanding of portratis in all media in British collections, for the benefit of future research, exhibitions, interpretation, display and learning programmes. A major monograph exploring the rich dialogue between drawing, photography and video that defines London-based Dryden Goodwin's hybrid practice. This volume includes several new works as well as Cradle, a continuing series of strangers photographed on the street at night. Published to coincide with a major exhibition of Goodwin’s work at The Photographers’ Gallery, London, this book brings together new work featured in this exhibition with earlier works to explore the rich dialogues between drawing, photography and video that define Goodwin’s hybrid practice. Cast extends these enquiries and their various collisions between drawing and photography and takes further Goodwin’s practice of drawing and scratching onto the surface of the image, something at once intimate and invasive, a physical intervention that the artist also characterizes as a way of ‘thinking into the photograph’ and into the stalled nature of photographic time. Exhibitionist: The best art shows to see this week. A Round up of the given week's essential art shows. A review of Pattern Recognition at City Gallery in Leicester. Rock is the final work presented in this exhibition. In this small scale monitor piece he plays and replays short sequences of tracings made from multiple photographs taken looking up at passengers as they approach and move past on the top deck of night buses. Plotting the arc of movement the animation plays these swooping motions back and forth and at different speeds. The fine red lines of the drawings create molten, fluid movement taking on an almost sculptural dimension. For Caul, Goodwin draws into the photograph using a digital drawing tablet, the artist presses onto its membrane-like surface with a digital stylus, the more pressure he exerts the deeper and more luminous the line he draws. A Caul is the name given to a portion of the amniotic sac that can be left over a child's face at birth. In some cultures, the caul has demonic associations; more usually it is considered sign that the child is safeguarded, even bestowed with special powers. Goodwin's title resonates with this association, reinforcing the visceral quality of the distinctive red lines that cover the faces of the people in the work, like blood vessels or raw tissue. In Casting Goodwin juxtaposes photographs of street scenes with drawings he has made from them, picking out individuals and then revealing, through repeated drawing and re-drawing, his extended process of looking and imagining. Again in this series there is ambiguity, the artist's repeatedly drawn heads suggesting a growing intimacy with his subject but also a developing forensic scrutiny, as if evidence is being compiled. Shapeshifter includes a display of nearly seven hundred small, rapidly made sketches drawn from direct observation of fellow passengers on trains. Goodwin presents these drawings both separately and amalgamated into one moving image work. The title Shapeshifter also refers to the work as something that could have almost supernatural overtones, comprised from a vast array of different individuals brought together to create a shimmering chimera. The first works presented here are from the series Cradle. In these new works, extended from a previous series, Goodwin etches into the print surface of black and white portraits he has made of passers by on the streets. As Goodwin inscribes into the print, as if to reach back to the moment of the photograph's original exposure and to his subjects' pensive moments of reflection, the title Cradle takes on a literal tone. The work becoming a site of nurturing in which he wonders about these strangers, imagining an affinity and even an intimacy with them. Nevertheless, within the scratching of the print's surface, a sense of violation also lingers, as does the subjects' vulnerability to a less than benign form of voyeurism. Bs1 was a two year programme of creative interventions in response to the evolution of Cabot Circus, in Bristol from building site to retail centre. Six artists, were invited to participate in the BS1 programme. The Bs1 project was conceived and organized by Neville Gabie who was the artist in residence during the build from 2006 to 2008, working closely with Sam Wilkinson of InSite Arts, the arts consultants for the whole development. Dryden Goodwin made a series of 12 etchings of heads responding to the different histories and cultures of the incredibly large number of people who worked on the development, local people as well as people originating from all around the world. An edition of prints were made from the plates, before the plates were permanently installed into a curved polished slate wall, part of the central stairwell to Cabot Circus. As part of a blog that was written during the process of the work Goodwin described...... ...The buildings themselves are, in a way, monuments to the work force, by creating a small, permanent and detailed record of just twelve of the different individuals, I hope to evoke and suggest a sense of the personal contribution of thousands. From featuring the individuals who are leading the whole development, across the spectrum to the bricklayers and canteen staff, in a single horizontal line, in no particular order, I want to emphasize a kind of democracy of shared endeavour. Placing this small scale series of portraits in the heart of the development next to the central stairwell and underneath the epic roof seemed to counterbalance the eventual inevitable invisibility of these people, this area being a place where visitors to Cabot Circus are encouraged to sit, rest, eat and talk. 22-23 November 2008 When feeling sad at home, I have often boarded a train or airport bus and gone to Heathrow where, from an observation gallery in Terminal 2 or from the top floor of the Renaissance Hotel along the north runway, I have drawn comfort from the sight of the ceaseless landing and take-off of aircraft. - Alain de Botton Forget rushing through airport terminals being scanned, x-rayed and cross examined. Heathrow is the ultimate destination to sit back, relax and just watch the world come and go. In the company of philosopher Alain de Botton you’ll be transported from Tokyo to Amsterdam, Istanbul to Warsaw, Seattle to Rio without leaving the comfort of the airport’s numerous lounges and waiting areas. Alain will introduce you to people whose lives are intimately linked to the airport, take you behind the scenes of the baggage handling minefield, explore the iconography of airports for artists and writers, and help you think more deeply about how we might all improve ourselves in the art of travelling. The first works presented here are from the series Cradle. In these new works, extended from a previous series, Goodwin etches into the print surface of black and white portraits he has made of passers by on the streets. As Goodwin inscribes into the print, as if to reach back to the moment of the photograph's original exposure and to his subjects' pensive moments of reflection, the title Cradle takes on a literal tone. The work becoming a site of nurturing in which he wonders about these strangers, imagining an affinity and even an intimacy with them. Nevertheless, within the scratching of the print's surface, a sense of violation also lingers, as does the subjectsï¿½ vulnerability to a less than benign form of voyeurism. The first two in a series of works combining multiple drawings with an animation. In both works 338 small dip pen and ink drawings search the expressions of an individual. The marks catch brief contrasting moments of serenity, anxiety, excitement, confusion, introversion, and both released and repressed tension. The accompanying animation loop presented on an iPod sequences the drawings in multiple combinations and in different rhythms attempting to extend a sense of exploration both of the activity of the artist and that of the named individual. A permanent commission made for a new building that combines health and local authority services in Hull. During September and October 2007 artist Dryden Goodwin, having been commissioned to make an artwork for The Calvert Centre created a series of small pencil portraits of individuals who represent the wide variety of people who will work at or visit the Calvert Centre. The constellation that this circle of portraits creates is an acknowledgement of the multitude of people that come into contact at the centre and also a celebration of their individuality. Importantly these portraits were made by the artist from direct observation whilst in the company of each individual. The conversation between the artist and sitter influenced the development of each drawing. The time it took for each of the portraits to be made was between 20 to 40 minutes. The small drawings have been enlarged as photographic prints to make them viewable from a distance. The location they are shown in is particularly significant. The portraits are suspended above the main intersection where people arrive before dispersing into different areas of the centre to interact in a variety of ways. The portraits depict patients, local residents of different ages, a doctor, a practice nurse, administrative staff, two local ward councillors, receptionists, council advisors and officers. The artist has commented on the project, saying that “Sitting down to make portraits of people moments after meeting them is engaging and intense. With each person we didn’t sit in silence, we talked as I was making the drawings. Each person brought their unique perspective, stories and character. Gaining a sense of someone through talking, looking, listening and drawing is a very vivid experience. My approach to each drawing seemed to change with each person and I hope the portraits in some way bring out distinctive qualities of each individual. Kettle's Yard: Narrative Symposium A symposium organized in conjunction with an exhibition of photographic and film work by the artist Sarah Dobai at Kettle's Yard it took place at at Lucy Cavendish College, Lady Margaret Road. The day will brought together speakers from a wide field of interests and experience, and opened up debate around the contemporary roles of narrative as both a formal and political device, in shaping knowledge, individual and national identity, as means of communication, and as a cultural artefact. A review of Goodwin's solo show at The Chisenhale Gallery, London, UK. In the large landscape pencil drawings, Goodwin maps and decodes over 360o of his surroundings, made directly in each location. Attempting to assimilate the whole panorama, the eyes dart around the space, plotting small details. 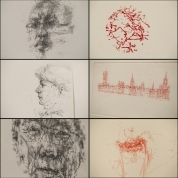 As a counter point, the seven smaller ink self-portrait drawings act as the pivot, mirroring Goodwin's active drawing process. Imbedded in the act of looking and recording is continual movement and animation. The focus cannot settle evoking certain disquiet; this undercurrent of paranoia is developed further in the sparing inclusion of figures in the space, suggesting potential dramas. Dryden Goodwin Minigraph & DVD. Minigraphs is a series of publications developed by Film and Video Umbrella devoted to contemporary artists working with film and video. Fully illustrated, and with specially commissioned essays and an extensive lists of works, this series provides an attractive and indispensable introduction to some of Britain’s most exciting contemporary artists. Dryden Goodwin’s film and video pieces are poetic celebrations of individuality and humanity, highlighting intimate moments and gestures against the backdrop of a shifting and evocative urban landscape. From photography and drawing to single-channel videos and multi-screen installations, this book explores a broad range of Goodwin’s work, while the accompanying DVD features 26 pieces, including ‘Heathrow’ (1994), and ‘Closer’ (2001), as well as a version of his multi-screen work ‘Dilate’ (2003) that allows the viewer to navigate through 64 possible permutations. Featuring people known to Goodwin, Red Studies are an on going series of watercolours begun in 2004. In each of these paintings, two images of an individual have been superimposed over eachother. Sometimes the difference between the expression and body attitude from one image to the next is slight, other times more extreme. Goodwin explores what is caught between these two moments, what is revealed and implied. 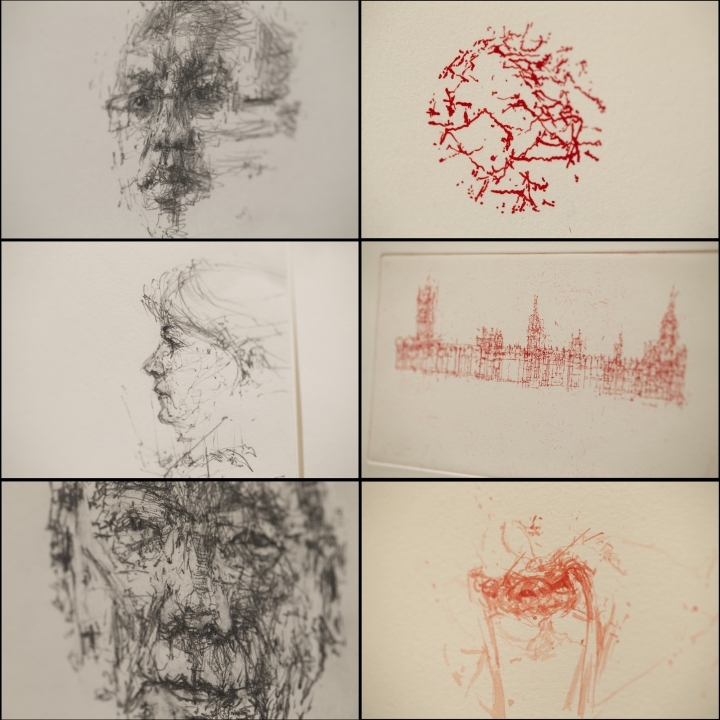 Four sequences of drypoint etchings from the on-going evolving series State. 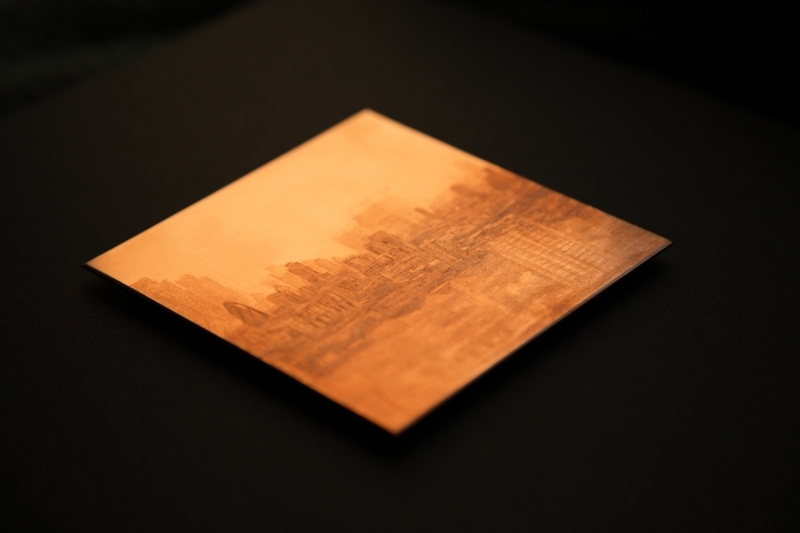 For each sequence Goodwin uses a single copper plate as a metallic palimpsest, repeatedly rubbed down for reuse, which holds traces of each incarnation of the plate. The individual prints show faint evidence of their predecessors, subverting the accumulative 'states' of the conventional etching process. Each sequence exists as a single edition, a type of monoprint drawing, shown with the plate as an inextricable component that contains each overdrawn layer. The finely detailed drypoint drawings offer an intense energy, depicting both human and landscape subjects. A time-based quality of constant reinterpretation is created, pushing and pulling the spatial proximity and contemplation of the subject, suggesting differing levels of alienation and intimacy. The multi-layered images hold an innate serenity in the mesh of overlapped expressions they contain. Snapshots of emotion have been worked over through the act of drawing or painting to imbue each portrait with a level of intimacy reflecting the relationship between Goodwin and the subjects who are all friends or family. The fragility of the lines is sometimes barely visible due to the scale of the paper and the distance at which the viewer is required to stand in order to have an overall sense of the figure and the multifarious stances they have been captured in. The portraits divulge a sense of the time spent studying the facial and bodily gestures of the subjects. The fragments of time captured in the photos are suspended further through the actual duration spent drawing or painting; small details and expressions are given intense concentration. The process of layering is an attempt to contain in a single image more detail about the individual. Although they are all two-dimensional images, each has a different time release as the viewer's focus shifts over time. Reveal consists of three elements, a single screen video projection with accompanying soundtrack and a series of 36 drawings. 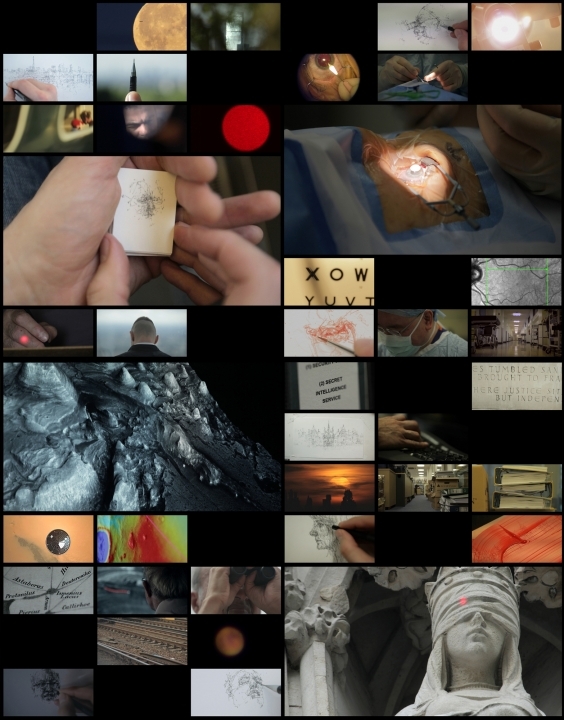 The video image focuses on the paper and the evolution of each portrait from the fixed viewpoint of a small camera device above a drawing board. The soundtrack plays back the developing conversations and interactions Goodwin has had with each stranger, with the surrounding wild sounds from the environment. The third element is the resulting drawings. Goodwin doesn't often make contact with the strangers he draws in public places. A person on a train may attract his attention by their expression or perhaps the way the light is falling across their face. He may be near by, trying to avoid catching their eye, but often he's drawing them from a distance or drawing their reflection in a window. In contrast in Reveal he introduces himself, declaring his intentions, requesting a time to spend in the individual's company. It is an unusual, even strange request with its own tensions. Goodwin is requesting a brief doorway, to be given permission to look intensely at a stranger. Within the proximity of each encounter the priorities of the drawing process are changed as he simultaneously negotiates a relationship with each individual whilst attempting to harness their likeness. The video recording allows the possibility to resuscitate the drawings reviving the brief relationships formed with each person when both are still full of possible outcomes. The video discloses the decision process and accumulation of marks for each drawing, as well as the incremental exchange between 'sitter' and 'artist'. In Reveal there is an opportunity to unlock the atmosphere of the setting of each of the static drawings on display. This enables the disclosure of the length or brevity, the comfort or discomfort or the success or failure of each encounter. It still remains that many aspects and subtleties of each interaction are concealed or distorted. However, it seems possible that these absences are active spaces for the imagination. Anticipation and speculation combine as each image unfurls gradually like a long photographic exposure. The short film Reveal focuses on the evolution of a portrait made on a piece of paper videoed from the fixed viewpoint of a small camera device above a drawing board. The soundtrack plays back the developing conversations and interactions Goodwin had with strangers whom he approached for permission to let him draw their portrait. The video discloses the decision process and accumulation of marks for each drawing as well as the incremental exchange between 'sitter' and 'artist'. This short film comprises of 2 encounters from a larger installation work in which the video of 36 different evolving portraits is projected. Above/Below evokes the relationship between public space and private visual encounter. The two screens, positioned horizontally at the top and bottom of the raised platform, project images filmed in Durham Cathedral, one of the largest religious buildings in Europe. The screen below centres around Goodwin's secret observations from the pinnacle of the Cathedral's tower filming through an invisible opening down onto the people and activities moving through the floor area known as "the Crossing". The screen above captures the intensely contrasting light that strikes the Cathedral visitors who glance upwards at the awe-inspiring structure. Goodwin has evolved a language between the camera's movement through space and the soundtrack that suggests different types of contact and exchange between above and below. The public's engagement is an active component of the work, searching for orientation between the two screens. The soundtrack is created from the wild sounds found in the Cathedral with elements of orchestration. Goodwin's panoramic video and sound installation, Dilate, encircles the viewer with projection screens. By setting the eight visual episodes in different combinations with the eight sound pieces, Dilate expands and contracts our perceptual horizons, heightening the viewer's awareness of physical and psychological space. Panning in and out of significant details of immersive 360 degree scenes, it reflects how our shifting sense of self informs our perception of space and vice versa. Faced with an open vista of a majestic natural landscape, we can feel liberated, isolated or paralysed; as part of the city, anonymous, identified or alienated; in the domesticity of our homes, safe, confined or overwhelmed; in a virtual network, empowered, remote or victimised. Dramatic and multi-faceted in its flow of images, Dilate also has a strong sculptural presence in the gallery, allowing the work to be approached from a distance and viewed both from inside and outside the formation of screens. The shifting soundscape fuses audio recordings captured on location with additional orchestration by the artist. The complete cycle of the sixty-four possible image and sound combinations takes 157 minutes. Two Thousand and Three is a filmstrip consisting of that many frames. On each of the individual film frames a different person appears, photographed during the massive protest marches against the war in Iraq, in London, in 2003. The installation presents two copies of the same film, the first copy is seen on the projection screen; the viewer is bombarded by the frenetic forward march of almost subliminal images. The second copy is presented in a light box table; studying the separate frames with a small magnifying loupe, visitors can form a more intimate, contemplative engagement with this series of discrete individuals. A teeming composite of details and fragments, it vividly captures the sense of individuals converging, a part and yet apart. Closer 3, screen video installation with soundtrack 3 screen video installation and soundtrack (2002) 11' 20 Goodwin's 3 screen video installation Closer investigates and subverts the encounters we have with strangers in public places. Using a zoom lens and a long distance laser pen Goodwin collapses the spatial distance between the camera's eye and its subject, filming individuals as he simultaneously touches them with a beam of light. A host of emotional, psychological and sociological implications arise from this act. The ambiguity of these gestures, fluctuating between hostility and empathy, demonstrate both a sense of invasion as well as implying feelings of sympathy towards these individuals. Despite his bold scrutiny of his subjects, in this process of familiarisation and intimacy, Goodwin also seeks to offer them a mysterious protection from the luminary stethoscope by finding vantage points where reflected lights and details of architecture partially obscures their faces. The Body in Architecture conference and publication presented a collection of both theoretical essays and architecture, urban & film based projects. The projects presented in the collection advance new ways of envisaging the city ranging from analytic apparatuses of viewing to design experimentations. The section on film presents innovative interpretations of forms and relations which, in one example, mediates multiple and fluctuating perspectives of space and, in another case, works experimentally through the use of film-making procedures along with more traditional means of architectural representations to plot time-space relations through the mechanism of the 'camera eye'. 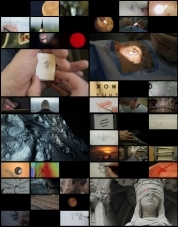 Contributions include over a dozen theoretical texts by DSD faculty and researchers and international scholars, practitioners and artists such as M. Christine Boyer, Karsten Harries, Anthony Vidler, Warren Neidich, Michael Muller, Scott Lash and an interview with Rem Koolhaas; and nine project contributions from among others, Stefano Boeri and the video artist Dryden Goodwin. Goodwin was invited by the singer/songwriter Matt Hales to produce an artwork for the first album of his new act, Aqualung. 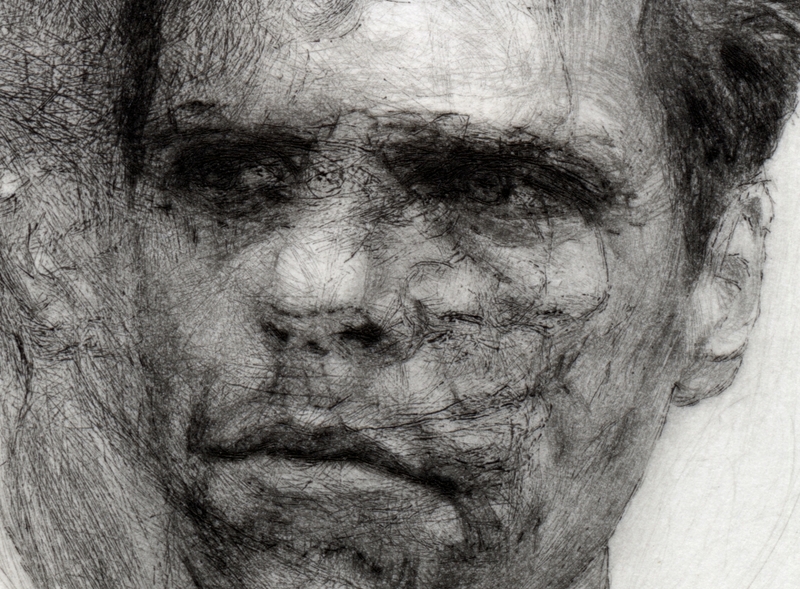 Goodwin firstly made a pencil portrait of Hales, entitled Matt (2002), as the latest in the series of drawings portraying delicate multi-layered representations of friends and family. This drawing become the key image for the album and inspired the concept for the music video created by Goodwin for the single Strange & Beautiful. Goodwin's aim was to extend the possibilities of the pencil portrait into an animated film that held all of the delicacy, enigma and intricacy of the drawing. The aim of the video was to extend Hales' character into the persona of the song. Through carefully choreographed phases sometimes revealing, sometimes obscuring Hales' features Goodwin draws out and heightens the subtle and shifting emotional expressions in the performance. The resulting 3.47 mins film incorporates hundreds of drawings fused in a finely crafted multi-layered animation. Goodwin's short film Closer investigates and subverts the encounters we have with strangers in public places. Using a zoom lens and a long distance laser pen Goodwin collapses the spatial distance between the camera's eye and its subject, filming individuals as he simultaneously touches them with a beam of light. A host of emotional, psychological and sociological implications arise from this act. The ambiguity of these gestures, fluctuating between hostility and empathy, demonstrate both a sense of invasion as well as implying feelings of sympathy towards these individuals. Despite his bold scrutiny of his subjects, in this process of familiarisation and intimacy, Goodwin also seeks to offer them a mysterious protection from the luminary stethoscope by finding vantage points to video where reflected lights and details of architecture partially obscures their faces. The series of drawings entitled Restaurant, Station, Street and Airport have evolved from a process of tracing groups of multiple projected slides taken in quick succession of four unknown individuals sighted in particular urban spaces. The built up structures of lines form layers of tracing, creating a way of slowing down these fleeting sightings. The process of drawing not only diagrammatically describes the physical space of the figures in the distinctive environments but, due to the inevitable subtle spatial distortions and the layering of each image, they evoke a particular psychological space. The drawings were made concurrently with the development of Closer (short film), (2001). 2nd in a series of works the first being Suspended Animation - 26 Drawings of the Same Photograph 1998. The work consists of 29 drawings of the same photograph. The drawings are presented in two forms alongside each other. (1) The framed drawings in a long continuous horizontal line around the gallery space. (2) As a video animation where the 29 drawings are transferred to video, one drawing appearing for one frame and then looped in a continuous animation. The multi-screen video installation Wait takes as its starting point the dramatic tension that surrounds the build up towards the moments when the last millennium changed into the present one. The work explores the continual universal desire to find significance and look constantly for the moment of change. Goodwin captures images of individual's participating in real-life situations, some mundane some more significant, such as a football fan waiting for his team to score, a groom waiting to say "I do", or a relative waiting at an airport arrival gate. The tri-parteid emotional structure of each of these events -anticipation, realisation and aftermath - is used by Goodwin as the blueprint to set up a matrix of emotional states. The projections of these individuals are in cropped close-up, focusing on their facial expressions and reactions. With a reduction of contextual reference points the imagination of the spectator is activated as they try to assimilate and understand the transformation of feelings that the individual undergoes. Goodwin interferes with these durations of time, exploring the ways our mind can bend time depending on our condition. When we 'will' a moment to come quicker, time appears to pass more slowly; yet if we seek to prolong a moment we become acutely aware of the speed at which it passes. By subverting the linear drama of these events through digital manipulation, Goodwin makes time more elastic. After stretches of time just waiting, we jump back and forth over the threshold of the critical moment, accentuating the dramas of the people we are looking at and involving our innate fascination and curiosity for other people. As with a number of Goodwin's recent works, Wait manipulates the relationship between the viewer and the viewed through the use of the zoom of the video camera to set up a singular contact between the two that is a strange balance between distance and intimacy. Spatial distance and optical proximity create an effect that goes beyond documentation giving the viewer a powerful sense of personal involvement as the camera becomes a psychological probe. Wait has evolved as the third part in a trilogy of video installations, including About (1998) and Within (1998). Each investigates the dynamics of urban public environments exploring the way we look at others and are in turn watched ourselves. As the spectator of Wait moves around and amongst the suspended groupings of screens, they are able to interact at close-quarters with the various micro-narratives occurring simultaneously. The images are set within a multi-layered soundtrack of Goodwin's own composition. The elements of the soundtrack, its recurring, shifting cycle of development, crescendo and recapitulation act as a counter point both of compliance and contradiction to the structuring of the pictures. Between the visual and aural are possibilities for extended fictions evolved from the original slices of fact. Artist's Presentation as part of Video Positive Festival. 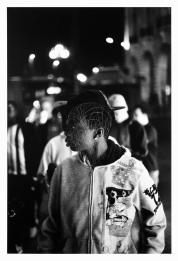 Further exploring our innate curiosity and fascination for other people, and the contact possible through looking, Goodwin has created the three sequences of images, entitled Drawn to Know, in which he works with photographs of strangers he has taken surreptitiously in public spaces. These individuals have been caught at moments of introspection. Approaching these small portraits, the viewer becomes aware of how Goodwin has traced and worked with the contours and subtleties of the individual heads and faces, replacing each original photograph, eventually totally working over them with drawing done with a digital stylus and tablet. In Drawn to Know - 14 X Woman fourteen frames, taken from video footage tracking a woman as she is passed by, are closely examined. In the matrix of drawn marks Goodwin holds and considers this fleeting encounter longer. In an attempt to discover, and make familiar, these tracings simultaneously create a fictionalisation of each character. As with Drawn to Know - 6 X Man where he traces the same photograph six times delicately shifting the quality of the man's character each time. Furthermore as with Drawn to Know - 12 X People the viewer moves along the sequence involving themselves with each individual, starting their own unique speculation about, for example, factual details such as age, where each individual may come from, their profession, as well as assessing them physically and emotionally. The veil of drawn marks imposed on these people by Goodwin complicates and distorts the usual dynamic between a viewer and the person in a portrait photograph. The drawing on these photographs acts as an ever present remnant of Goodwin's own time investment, a by product of the processes of thought about these essentially unknowable individuals. A large video projection, shown at night on the front of the gallery. The video is accompanied by a soundtrack amplified into the background sounds of the city. The footage concentrates on various sightings of spaces through windows, caught on camera, viewed momentarily, late at night, from a moving nightbus. Individuals, groups and empty spaces, held on a few frames of videotape are digitally manipulated, creating a strange, slow motion. By manipulating these found situations Goodwin plays with the relationship of documentor and storyteller. Goodwin's installation conveys a voyeuristic quality that is rendered especially powerful and direct by his rare but bold use of colour. The treatment of the filmed episodes draws the viewer into a complicit relationship with the camera's prying gaze, pandering to innate human curiosity into the privacy of other people's habitats. This central tension is further agitated by the orchestrated soundtrack that Goodwin has created. Over the course of the whole cycle he fuses different sound pieces with the same images, shifting the viewers reading of each situation. This multi-media installation was created in response to the large warehouse space of Berry House, Clerkenwell, London. The cavernous, hangar-like space lent itself to works which revisited the ideas of airports and flight. The positioning of the three works is key to the show and the dynamics that arise between the various components as described below... One Thousand Nine Hundred and Ninety Eight (1998) 16mm film loop A 16mm film loop consisting of that many frames, each frame containing a different aeroplane fuselage, filmed from beneath in close proximity as the aircraft take-off and land. The film is suspended in a rectangular formation in the space and fed through a projector. The projector is tilted so that the image is angled above the viewer on a large screen. The installation of the film loop creates a shift in scale between the miniature aeroplanes on the film itself moving around the space and the large scale of the projected image. The projector used to show the work is slowed down to run at 12 p.s. Suspended Animation - 26 drawings of the same photograph (1998) Twenty six self-portrait pencil drawings of the artist (aged 26 at the time of making the work) are transferred onto video, sequenced in different orders and looped. Each of the 26 drawings is based on the same photograph of the artist and is held for the duration of a frame's length. The work is exhibited on a monitor placed on a specially designed plinth that mirrors the height of the artist to create a life-sized, continuous, suspended animation. Drawn from Memory (1998) (Flick book - pencil on paper) Hand drawn flick book, with one hundred aeroplanes drawn from memory, drawn from the perspective of looking up at the aeroplanes as they pass closely above. Within considers the contents of short everyday encounters, captured as moving vignettes, while Goodwin travels on different modes of transport, through different urban environments. The piece draws on the potential for multiple interpretation of each small gesture and glance, commonly experienced but ignored in everyday life. In his recent video installation About (1998), Goodwin exploits these notions along a linear time structure. Following this mode, Within delves further into the nature of these fleeting relationships as the camera exaggerates the way we watch others and are in turn watched ourselves. Isolating these experiences allows them to be examined as artefacts or curiosities. By repeating, looping, reversing, slowing down and speeding up these pockets of time, the treatment becomes non-linear. The soundtrack with its changing motifs is also played in a loop, setting different movements against different encounters, enriching the matrix of interpretation. Originally filmed in late August and early September 1997, The installation presents a 16mm film loop and a light box. Both works process and present the same black and white 16mm film strip in different ways. The length of film used is exactly 1,997 frames long, each frame containing a different individual photographed around the Royal Palaces, in London, in the few days after the death of The Princess of Wales. One Thousand Nine Hundred and Ninety Seven (film loop) (1997) The film strip is looped through a projector and run through hooks in a rectangular formation around the gallery. The images are projected directly onto the wall. The projector is situated close to the wall, rendering the images small, bright and intense. The collection of individual portraits, in themselves fleeting and insignificant, accumulate to form an epic whole. The work seeks to set up a tension between the recording and presentation of the individual moments and that of the larger historical moment. As the activity of surreptitiously taking the individual photographs was pressurised, so too the viewer struggles to keep pace with the bombardment and frantically paced changes of the film loop. The viewer seems to key into certain individuals who act as triggers to the imagination or memory. The work brings to the fore the intrusive role of the camera. Parallels appear between the photographing of people in mourning and the role of the camera in recording The Princess of Wales' life; prying and occasionally intruding, the camera reveals a range of reactions some indifferent, some uncomfortable, some engaged. One Thousand Nine Hundred and Ninety Seven (light box) (1997) The film strip is cut up into individual frames. These tiny transparencies are rearranged from the original lineage in which they were shot. New configurations and groupings of the images are placed between two sheets of glass in the light box, like historical artefacts. The separate frames are re-categorised by locations, expressions and quality of light. Using a small magnifying loupe, hanging by the box, the viewer is able to examine closely the individual portraits, setting up a strange one to one relationship between the viewer and the viewed. One Thousand, Nine Hundred and Ninety Six, is a 16mm film loop consisting of that many frames, each frame containing a different car, filmed over looking a motorway. A distinctive tension is set up between the projected image and the transparent image of the visible film material itself, giving the viewer two opportunities to view the separate frames. The projected image shines directly onto a wall, it is small bright and intense in colour. There is an agitation within the projected moving amalgam of cars, as certain colours and brands are momentarily recognised but continually renewed. Although it is possible to try and view a particular car again the film keeps moving as it makes its way through hooks suspended over 40 feet around the room. Quentin Cooper - presenter of BBC Radio 4's weekly The Material World, chaired this special event taking place on the roof terrace in proximity to Richard Wilson’s Hang On A Minute Lads, I’ve Got A Great Idea... This lively debate considered the physiology of balance and poise, including discussion of the aesthetic qualities of sport/ dance (grace and presence) before moving on to consider neurological skill development in athletes. It featured a dance performance by Subathra Subramaniam, contributions from neuro-scientist Morten Kringelbach, Rambert’s scientist-in-residence Nicky Clayton, as well as dance-scientist Elsa Bradley and Everything Flows artists susan pui san lok and Dryden Goodwin. The discussion was followed by an opportunity to meet the speakers. A small bio and summary of Goodwin's practice. For the Artist's Dictionary. Book published to accompany a solo show. Drawing Projects - An Exploration of the Language of Drawing. Malsen, M., Southern, J. (2011). Hang Them - Very Unofficial Royal Portraits. Goodwin, D. (2010). Who will lead British art after YBAs? Park, M. (2010). Review: Linear. Jones, J. (2010). 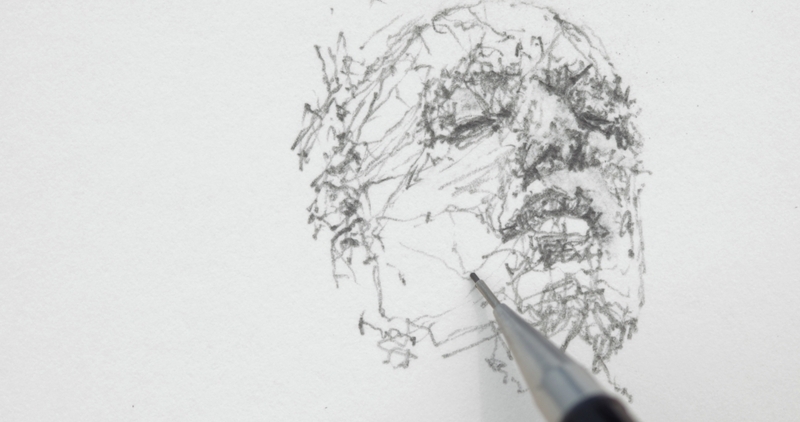 Guardian - Guide to Drawing: Artist Dryden Goodwin on how he draws. Berning, D. (2009). In Conversation with Barney Dicker. Dicker, B. (2009). Dryden Goodwin's ordinary strangers. Jones, J. (2008). Soho Archives: 1950s & 1960s; Dryden Goodwin: Cast. Review. Alkayat, Z. (2008). In the Studio: Dryden Goodwin. Sumpter, H. (2008). Taking a stealthy interest in night lives around West End. Welham, J. (2008). Top Galleries: Francis Bacon; Rothko; Cut and Paste Photomontage 1920-50; Dryden Goodwin - Cast. Campbell-Johnston, R. (2008). Figuring landscapes. Elwes, C., Ball, S. 2008. 'Flight' into surreality Dryden Goodwin's video installation is a highlight of the Platform animation festival. Libby, B. (2007). A Tension Dryden Goodwinâs âFlightâ: the search for a line. Evans, G. (2007). Dryden Goodwin Stephen Friedman Gallery - West End. Coomer, M. (2006). Dryden Goodwin Chisenhale Gallery, London UK. Bonham-Carter, C. (2006). Art Review: âThe Animatorsâ. Danby, C. (2006). Dryden Goodwin Chisenhale East End. Sumpter, H. (2006). âThe Animatorsâ. February 2006. OâReilly, S. (2006). Strangers with Angelic Faces. 2006. A History of Artists' Film and Video in Britain. Curtis, D., Institute, B. F., 2006. The Body in Architecture. Hauptmann, D., 2006. The Portrait Now. Nairne, S., Howgate, S., 2006. London: Stephen Friedman Gallery DRYDEN GOODWIN. Kitamura, K. (2005). Film Art Phenomena. Hamlyn, N., 2003. Reality Check. Goodwin, D., 2002. Fantastic Recurrence of Certain Situations. Bush, K., Day, C., 2001. The Other Side of Zero - Video Positive. 2000. Video Cult/ures-Multimedia Installations of the 90s. 1999.